February and March in Montana are often the coldest, windiest, snowiest and altogether most miserable months of the year. Temperatures can dip to 30 degrees below zero Fahrenheit and wind speeds can gust upwards of 50 miles per hour. It’s a great time of the year to stay inside and catch up on your reading because generally, unless you’re on skis or a snowboard, spending time outside is not fun. For me, the silver lining to the months of February and March is that with the misery of the weather, on the Johnson Ranch these months also bring the excitement of new life — baby calves. Why Calve When it’s Cold? Montana ranchers breed their herds to calve at different times throughout the year. While there’s not necessarily a right or wrong time to calve, the rancher must do what’s best for his or her operation. On the Johnson Ranch, we calve in the late winter/early spring— generally from February 1 to March 31. To those removed from ranching, it can seem counterintuitive to calve during the cold winter. Introducing fragile babies to the world when the elements are harsh seems harsh in and of itself. However, there is logic to the timing. One reason for breeding cows so they calve in February and March is so it fits within the cycle of other activities on the ranch. If cows were calving at the same time the grain crops were being planted or harvested, they wouldn’t receive the attention they need while they give birth. During February and March, my mother and father-in-law focus 100% of their time on the health and well-being of the herd— they are not pulled in any other direction by competing farming obligations. They check the herd almost hourly to see if cows are going into labor, if new calves have been born and if the general welfare of the animals is good. They are completely aware of any potential birthing hazards and can address high risk situations in a much more timely and focused manner than they could if they were pulled in other directions by farming activities. Another reason for calving in the early spring is for the purposes of disease control. While the conditions on the ranch certainly don’t mimic those of a hospital, we do care about cleanliness and the spread of disease. Generally, when conditions are cold, disease doesn’t spread as quickly. This is as true on a ranch as it is in a hospital. In our case, we have found that calving in slightly colder conditions affords us a healthier and heartier herd. What is the Birth Like? For many who aren’t around ranching, there is a misconception that every cow that goes into labor has her calf “pulled” by the rancher. 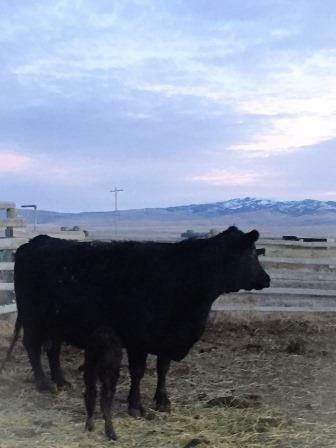 While ranchers and veterinarians must occasionally pull calves that are stuck in the birth canal or help a cow who is having trouble with her labor, most births are natural. When calving season begins, we move our cows to protected areas in pastures and corrals near to our calving building and barns. In these areas we are better able to closely monitor the herd and look for signs that a cow may be ready to give birth. A switching tail, an enlarged udder and general nervous behavior are, among others, visual cues that a cow is ready to go into labor. When we notice a cow ready to give birth, we will watch her closely. We pay close attention to how the legs of the calf are coming out of the birth canal. 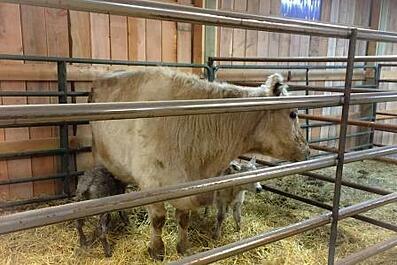 If the natural birth is progressing normally, we will allow the cow to birth on her own. If the weather is very cold, we will take the cow and the newborn calf into the calving shed to birth and nurse where it is warm. If the weather is suitable and the cow and calf are healthy, generally they can remain outside. If the cow is having trouble giving birth and the calf is stuck in the birth canal, we quickly get the cow into the calving building and prepare to pull the calf. We have a specialized birthing chute for cows that need their calves pulled. The chute puts the cow in a humane and comfortable birthing position and also protects the rancher or veterinarian in case the cow should kick as she is giving birth. 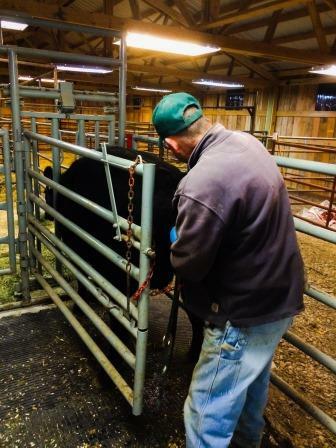 Generally, the deliveries of cows that need pulled can be likened to a human delivery of a “forceps” baby— these cases are generally taken care of by the rancher. 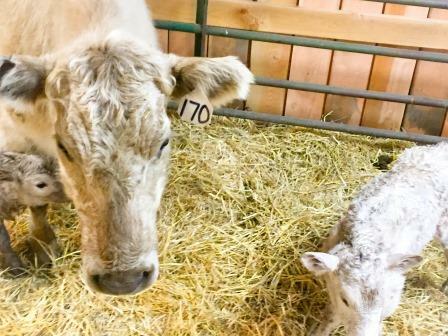 In severe cases, the rancher will call a veterinarian to ensure the delivery is as humane, safe and pain-free for the cow and calf as possible. After calves are born, it is vital that they begin to nurse from their mother as soon as possible. The first supply of milk from the mother contains a hormone called colostrum. Colostrum is vital for immunity development and it’s important that a calf gets this first feeding within several hours of birth. In the unfortunate and rare circumstance that a cow or calf should perish during the birthing process and leave behind one or the other, we work to pair (or “graft”) them to another cow or calf. This will allow the cow to use the milk that her body is naturally producing and allows the calf the opportunity to feed from and be nurtured by a mother. Often, if a cow gives birth to twins, she has trouble supporting both calves and the “runt” of the pair will be grafted to another cow. On the Johnson Ranch, the cow and calf are kept together as a pair for about six months before they are weaned. This is ample time for the calf to grow and mature at a healthy rate. They stay on the ranch until late spring, then they summer along the banks of the Big Hole River. After the cold of the winter and early spring subsides, springtime on the ranch becomes one of my favorite seasons. The earth is re-awakening, the snow is melting and the smell of refreshed soil lingers in the air. The baby calves add to the joy of the season. Like other babies, they are curious and playful creatures. They will chase each other, play together and, occasionally, even get scolded by their mamas. It’s a fun and endearing sight to see. And What Does This Have to Do With Growing Grain in Montana? Growing grain, ranching, farming— it’s all cyclical. Year in and year out, we may make small changes to the cycle, but overall it endures. 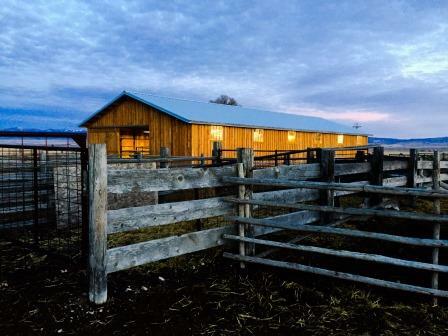 For our Montana grain farm, cattle are an integral part of that cycle. They eat the hay grown on the ranch, they use the straw from the grain for bedding, they nourish our fields and they provide a vital source of income to the ranch. It’s hard to believe it’s almost been a year since I started this series of blogs about life on our Montana grain farm. Next month, the cycle will begin again and we will plant the crops for our 2015 season. 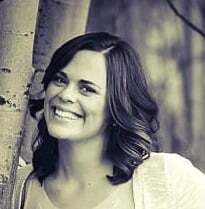 Read the whole series about grain farming on the Johnson Ranch here. Are you holed up somewhere waiting for the worst of winter to pass? You can have Great Harvest breads and goodies delivered right to your door while you stay warm and cozy. Get the bread here: order bread online. Make a great soup to go with it: try Venison Chili, Butternut Squash Soup, or Spring Vegetable Soup. Read our eBook on Whole Grains and feel even better about your food!